Reblogging on Archer’s Aim – Have a look at a character from The Bow of Destiny being interviewed on Lisa Burton Radio! Welcome to another edition of Lisa Burton Radio. Now broadcasting at one point twenty-one jigawatts across all the known galaxy, alternate realms, and into the future and past. I’m your host, Lisa the robot girl. Our guest today is Limbreth, a young woman, on a quest to recover a stolen book and find the Bow of Hart. I am pleased to host C. S. Boyack on today’s edition of Fantasy Authors Unplugged. He has a new book out named Yak Guy which I’m thoroughly enjoying. I turn it over to Craig. Thanks for having me over today to talk about my newest book, The Yak Guy Project. This is an alternate world kind of story about a spoiled and dysfunctional young man who gets placed in an environment where nobody is going to put up with his crap. As a fantasy author, I thought P.H. Might appreciate a small part of the world building in this story. Part of the world building here is the warring factions. Yak Guy starts off in the wilderness, and has to pick up some basic survival skill, and fast. Fortunately, he has a guide in the form of a talking yak. Once Yak Guy learns to take care of himself, the yak offers to take him to one faction or the other. The choice is his, but it’s irreversible. He soon learns the people have been at war here for hundreds of years. Finding a way of portraying that was part of the fun in writing this story. They destroyed everything, and are back to fighting with spears and swords. Yet there is evidence of what they lost in the form of debris from ancient battlefields in the wilderness. He even finds one silk painting of a squadron of jet fighters still hanging in the home of the city’s most prominent person. The population here is primarily Asian, but there are other races all over the place. This was my way of indicating that mass transportation existed before these people destroyed themselves. I know languages started and localized based upon physical barriers, like mountain ranges and oceans. What would hundreds of years do to what used to be a common language? The opposing faction in this story speaks a language we can vaguely understand. It’s one of my hints that everyone used to be a common community here. As part of his growth, Yak Guy is helped out by a friendly Hermit. This fellow speaks a language he can vaguely understand. He comes to realize that the little people are still people. Wars are waged on a higher level, and it’s the little people who pay. There are many lessons ahead for Yak Guy, and it’s sprinkled with enough sword fights, predatory lions, and pretty girls to keep it interesting. I hope I’ve convinced you to take this journey with my Yak Guy. 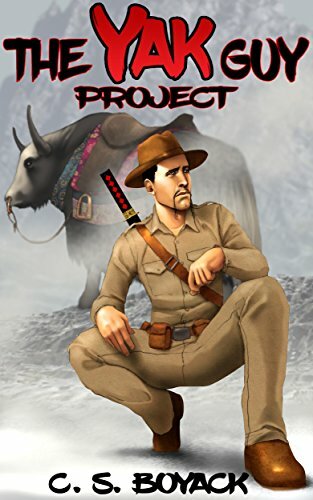 Find The Yak Guy Project on Amazon. Talking Yak? You bet and much more. Give this book a try and I think you’ll enjoy it – I know I have! Thanks to Craig for being on the blog today and best wishes with the new book.